In shoulder arthroplasty, there is a trend for shorter humeral implants to facilitate stem revision and preserve bone stock. This review evaluates the clinical and radiographic outcome of anatomical total shoulder replacement with uncemented humeral short stems. 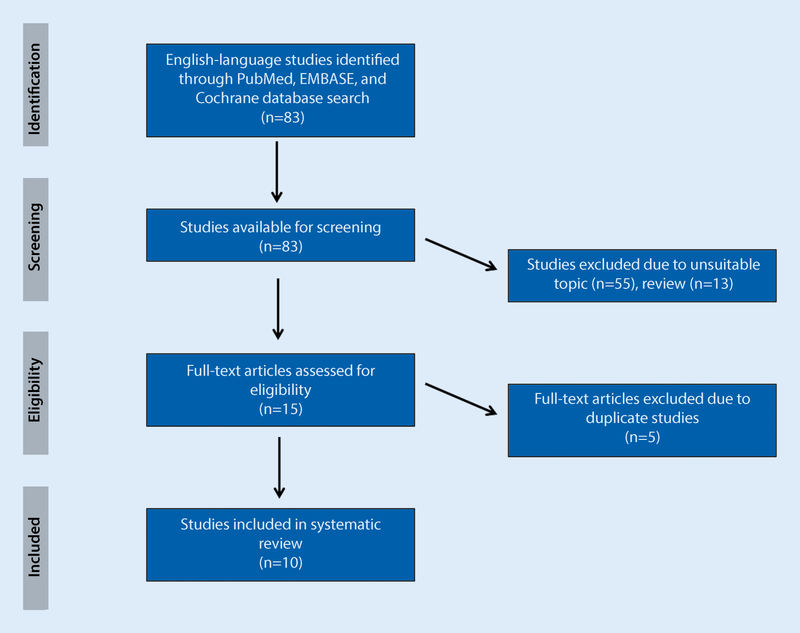 A systematic review was performed using PubMed and Cochrane databases. The search terms “short stem” (all) and “shoulder” (title/abstract) were used. The minimum follow-up was 20 months. The demographic data, clinical outcome (pain, range of motion, outcome scores), radiographic outcome (humeral bone adaptations, humeral loosening, glenoid loosening), risk for high radiographic bone adaptations, complications, and revision were determined. Ten studies comprising 653 shoulder arthroplasties were included in the analysis. At an average follow-up of 20–64 months, the clinical parameters of pain, range of motion, and outcome scores improved significantly in all studies. The most frequent radiographic finding was calcar resorption in 15–71% of patients. High filling ratio, lack of metaphyseal porous coating, and poor bone quality were associated with high bone adaptation. The radiographic changes did not influence the clinical outcome in any study. In 13 of 653 patients (2%), humeral stem loosening was observed leading to stem revision in nine patients, with one study reporting eight of 73 patients with humeral stem loosening. The average weighted complication rate was 6% and the average weighted revision rate was 4%. The short- to medium-term results of uncemented anatomical short-stem shoulder arthroplasty are encouraging and the clinical results are comparable to other 3rd- and 4th-generation shoulder arthroplasties. Further studies with longer follow-up are needed to evaluate and understand why the radiographic changes occur and to prove the theory of bone-sparing revision surgeries. Der aktuelle Trend in der Schulterendoprothetik geht weg von Langschaftprothesen hin zu metaphysär verankerten Kurzschaft- oder schaftlosen Prothesen. In der vorliegenden Übersichtsarbeit werden die klinischen und radiologischen Ergebnisse von anatomischen Kurzschaftprothesen am Schultergelenk dargestellt. Zunächst erfolgte eine systematische Literatursuche über PubMed und die Cochrane-Datenbank. Als Suchbegriffe wurden „short stem“ im Feld („all“) und „shoulder“ im Feld („title/abstract“) verwendet. Studien mit einem Nachuntersuchungszeitraum von mindestens 20 Monaten wurden in die Analyse eingeschlossen. Folgende Parameter wurden ausgewertet: demografische Daten, klinisches Ergebnis (Schmerzen, Bewegungsumfang, klinische Outcome-Scores), radiologisches Ergebnis (knöcherne Anpassungsvorgänge humeralseitig, Schaftlockerung, Glenoidlockerung), Risikofaktoren für knöcherne Anpassungsvorgänge, Komplikationen und Revisionsoperationen. Insgesamt wurde 10 Studien mit 653 implantierten anatomischen Kurzschaftprothesen eingeschlossen. Im Nachbeobachtungszeitraum von 20–64 Monaten wurde bei allen klinischen Parametern eine signifikante Verbesserung von prä- zu postoperativ erzielt. An radiologischen Anpassungsvorgängen wurde eine Resorption im Bereich des Kalkars bei 15–71 % der Schultern beschrieben. Als Risikofaktoren für das Auftreten von radiologischen Anpassungsvorgängen wurden eine große Schaftdicke im Vergleich zum Schaft, das Fehlen einer metaphysären Aufrauhung und eine verminderte Knochenqualität identifiziert. Die radiologischen Anpassungsvorgänge hatten in den Studien keinen Einfluss auf das klinische Ergebnis. Bei 13 von 653 Patienten (2 %) wurde eine Schaftlockerung festgestellt, und 9 Schäfte wurden revidiert, wobei in einer einzigen Studie 8 von 73 Schäften eine Lockerung aufwiesen. Die durchschnittliche Komplikationsrate betrug 6 % und die durchschnittliche Revisionsrate 4 %. Die kurz-bis mittelfristigen Ergebnisse der anatomischen Kurzschaftprothesen am Schultergelenk sind vielversprechend, und die klinischen Ergebnisse sind vergleichbar mit den Schulterprothesen der 3. und 4. Generation. Weitere Studien mit längerem Nachbeobachtungszeitraum sind notwendig, um die knöchernen Anpassungsvorgänge besser zu verstehen und um zu zeigen, dass eine knochenschonende Revision der Kurzschäfte möglich ist. 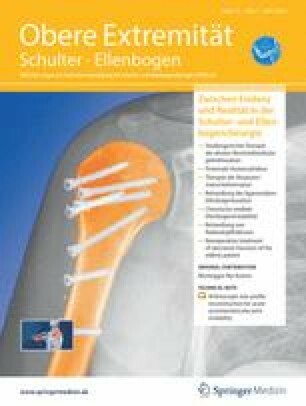 Anatomical shoulder replacement has been established as a successful treatment option in shoulder pathologies, such as glenohumeral arthritis, inflammatory arthritis, or avascular necrosis of the humerus [10, 17, 28, 31]. The third generation of shoulder arthroplasty with standard-length humeral stems yields good to excellent long-term results. However, standard-length humeral stems are associated with high rates of stress shielding and a risk of proximal humeral bone loss in the case of revision surgery [1, 3, 6, 27]. In an effort to mimic native bone stress and to preserve bone in the case of revision surgery, design modifications led to the fourth generation of shoulder arthroplasty with stemless or short-stem humeral components aimed at metaphyseal fixation [7, 11, 14]. In 2016, Harmer et al. performed a systematic review of stemless and short-stem shoulder prosthesis and found that only one study reported results of anatomical shoulder replacement with an uncemented short stem . The authors therefore concluded that longer-term and better-designed studies are needed if short stems and stemless components are to become the gold standard for care. Since then, several studies have reported results of anatomical shoulder replacement with uncemented short stems. In 2016, Casagrande et al. reported their experience with an uncemented short-stem shoulder prosthesis in 73 patients . Six of the 73 patients underwent revision surgery due to loosening of the humeral stem within a mean follow-up period of 28 months. These alarming results necessitate a systematic review of the clinical and radiographic outcome of short-stem anatomical shoulder replacement. This review aimed to evaluate the clinical and radiographic outcome of anatomical total shoulder replacement with uncemented humeral short stems. A secondary aim was to identify and summarize potential risk factors associated with stem loosening in short-stem shoulder arthroplasty. A systematic review was performed following the checklist of the Preferred Reporting Items for Systematic Reviews and Meta-Analyses (PRISMA). A search using the terms “short stem” (all) and “shoulder” (title/abstract) was undertaken by two reviewers using the PubMed and Cochrane Central Register of Controlled Trials databases. Studies were included in the current review if they met following inclusion criteria: implantation of an uncemented humeral short stem and original studies of human subjects with evidence level I to IV with a minimum follow-up of 20 months. Short-stem prostheses are designed with a standard shaped stem with a length of <100 mm from head to tip. The implant ends distally in the diaphyseal intramedullary canal without touching the cortex. The stem is fixed and stabilized within the metaphysis. By contrast, standard stem prostheses are longer (>110 mm). They are fixed at the metaphyseal cortex, either “press fit” or with bone cement. In a stemless prosthesis, the implant does not enter the medullary canal of the diaphysis. Many different indications for anatomical shoulder replacement were included. The titles and abstracts were reviewed for suitability. Among studies reporting heterogeneous treatments (i. e., standard length and short-stem shoulder arthroplasty), only those that reported outcomes for short-stem shoulder arthroplasty separately were included. Studies reporting on duplicate studies of the same patient cohorts were excluded. Full-text references were reviewed to identify any previously unidentified studies related to the study topic. A flow chart summarizing this selection algorithm is shown in Fig. 1. The demographic data, clinical outcome (pain, range of motion, outcome scores), radiographic outcome (humeral bone adaptations, humeral loosening, glenoid loosening), risk for high radiographic bone adaptations, complications, and revision were determined. Where possible, weighted means were calculated for outcome variables. Ten studies met the inclusion criteria and were analyzed in the current review. Eight of the ten studies were case series (level IV therapeutic studies), one study was a retrospective comparative study (level III), and one was a prospective case series (level II). Four different kinds of short-stem prostheses were implanted in the studies: Apex (Apex; Arthrex, Inc., Naples, FL, USA), Ascend Monolithic (Ascend Monolithic, Wright Medical, Memphis, TN, USA), Ascend Flex (Ascend Flex, Wright Medical, Memphis, TN, USA), and Biomet Comprehensive Mini/Micro stem (Bio-Modular Shoulder Mini Stem; Biomet Inc., Warsaw, IN, USA). The characteristics of these short-stem prostheses are listed in Table 1. A series of publications conducted at the ATOS Clinic Heidelberg (Germany) and the Orthopédique Santy in Lyon (France) were identified [22, 23, 24], and the most recent of these three studies is included in this review. Three multicenter studies [8, 9, 21] performed in the United States and reporting the outcome of patients treated with two kinds of short-stem shoulder arthroplasties are included. The studies by Romeo et al. and by Denard et al. are included in the analysis. One longitudinal study by Schnetzke et al. that reported on the outcome at two different time points (2.6 and 5.3 years) was included. The other studies included one final follow-up without a direct longitudinal comparison with the same cohorts at previous time points. In 2011, Jost et al. reported the results of 49 anatomical short-stem shoulder replacements using the Biomet Comprehensive™ (BC) with mini and micro stems (Table 2; ). In 2010, Wright/Tornier launched their first type of short-stem prosthesis, the Ascend Monolithic™ (AM), which did not include the option for convertibility or proximal porous coating. There are four studies available reporting on the outcome of 255 patients treated with the AM for different indications. Subsequently, design modifications led to the second generation of short-stem prostheses, the Ascend Flex™ (AF), with a more voluminous and rough titanium porous-coated metaphyseal part and with convertibility from anatomic to reversed design. Six different studies reported the outcome of 288 patients treated with the AF prosthesis for different indications. The study by Raiss et al. reports only the radiographic results of 150 patients treated with the AF prosthesis . The clinical results of a part of this patient cohort (n = 65) were published by Schnetzke et al. in a separate study . In the studies by Morwood et al. and Szerlip et al. the outcome of the AM and the AF was compared. Denard and coworkers  did not differentiate between shoulders treated with AM or AF. Finally, Arthrex has developed a short-stem shoulder prosthesis called Apex™ (AP) and Romeo et al. reported on the outcome of 64 patients treated with this kind of prosthesis for primary or secondary osteoarthritis. Clinical outcome was reported for 571 shoulders with a mean follow-up of 28 months (range: 20–84). Significant reduction of pain and improvement in range of motion as well as improvement of the outcome scores from preoperative status to final follow-up were reported in all studies (Table 3). Three studies used the standard visual analog scale for (VAS; 0 = best, 10 = worst) for reporting pain improvement. In these studies, the VAS significantly decreased from 6.0 to 1.3 at the final follow-up. Five studies used the pain component of the Constant–Murley scoring system (0 = worst, 15 = best) and one study used the pain component of the American Shoulder and Elbow Surgeons shoulder score (ASES; 0 = best, 10 = worst). The Constant–Murley score (CMS) showed a statistically significant improvement in pain in the studies included, with an average change from 4.4 to 13.2 at 8.8 years. One study that used the ASES pain score also reported a significant decrease in pain (5.2 to 0.9). The range of motion was reported in all studies included; flexion improved significantly from 99 to 151° and external rotation from 18 to 49°. Abduction was measured in five studies and the average improvement was +65° (82°–147°). Different outcome scores were used to assess global shoulder function: the CMS (five studies), age- and gender-adjusted CMS (CMS%; four studies), and the ASES (five studies) were used most often. The average CMS significantly improved from 31 to 77, the CMS% from 38 to 105%, and the ASES from 40 to 82. In the longitudinal study by Schnetzke et al., the CMS improved significantly to a mean of 76 points at the first follow-up after 2.6 years and remained stable, at a mean of 77 points, at the final follow-up after 5.3 years. Radiographic changes were reported in 646 shoulders (Table 4). All studies reported radiographic changes with a particular focus on humeral bone adaptations and the rate of humeral loosening. The description of the radiographic changes is inconsistent throughout the studies included. In 13 of 653 patients (2%), humeral stem loosening was observed leading to stem revision in nine patients, with one study reporting eight out of 73 patients with humeral stem loosening. Eight studies reported on the frequency of calcar resorption ranging from 3 to 71%. One study by Schnetzke et al. reported the radiographic results at two different time points, after 2.6 years and 5.3 years, and found that the overall rating of the shoulders considered to have high bone adaptation decreased from 42 to 37% at the final follow-up. Cortical bone narrowing and osteopenia in the region of the calcar decreased from 76 to 66% between the first and the second time point. In three studies, risk factors for the development of radiographic changes were carefully analyzed. A high metaphyseal filling ratio (defined as quotient of the diameter of the prosthesis and the humerus at the level of the distal border of the humeral head) and a high diaphyseal filling ratio (defined as quotient of the diameter of the prosthesis and the humerus at the distal third of the stem) of the humeral short stem led to significantly higher rates of bone adaptions in the studies of Schnetzke et al. (p ≤ 0.007) and Raiss et al. (p ≤ 0.003). Lack of proximal porous coating was also identified as a risk factor for higher rates of calcar resorption. Having a short-stem prosthesis without proximal porous coating was associated with calcar resorption in 12–71% of cases. In short-stem prostheses with added porous coating, calcar resorption was noted in 3–39% of cases. Humeral loosening was observed in 13 shoulders, and all patients received a shoulder replacement with the AM prosthesis. Casagrande et al. reported high rates of humeral loosening in their study (8/73 patients with humeral loosening). A detailed analysis of this study revealed that the humeral loosening was related to an infection in five patients. Szerlip et al. reported three patients with aseptic humeral loosening occurring before the 24-month follow-up. All of these patients were female with osteoporotic bone. This finding was confirmed by Raiss et al., who observed that a cortical contact of the humeral stem, female gender, as well as patient age > 65 years and a cortical thickness of <6 mm were also associated with high bone adaptions (p < 0.024). Complications and revision are reported for 578 patients in nine studies (Table 5). The weighted average complication rate was 6% (0–15%) and the weighted average revision rate was 4% (0–12%). The most frequent complications were aseptic humeral loosening (n = 9) and septic humeral loosening (n = 4) leading to nine humeral stem revisions. Humeral stem loosening was only observed in patients treated with the AM stem without proximal porous coating. Casagrande et al. reported the most frequent complication (15%) and revision rates (12%), and a high rate of infection was also reported (four stems with septic loosening). Excluding this study, the weighted average complication rate was 4% and the weighted average revision rate was 2%. Standard long-stem humeral components are associated with complications, such as intraoperative fracture of the humerus, stress shielding, aseptic loosening, and periprosthetic fracture [1, 3]. This may result in massive bone loss, which requires complex revision surgery. The rationale of implants with metaphyseal fixation that are either stemless or have a short humeral stem is the facilitation of stem removal and preservation of bone in the event of revision surgery . One other important aspect is the occurrence of stress shielding in long-stem humeral components, which is associated with aseptic loosening and bone loss in the longer term . Metaphyseal fixed implants should minimize this phenomenon. The effect of reducing stem length has been investigated for implants at other joints, including the distal ulna and hip [2, 20, 30]. Reduced stem lengths have been shown to closely mimic the intact state. In 2016, Razfar et al. performed a finite element analysis for shoulder arthroplasty with intact shoulders and three reconstructed (standard length, short, and stemless implants) finite element models and found that reducing stem length produced humeral stresses that more closely matched the intact stress distribution in proximal cortical bone . In 2016, Harmer et al. wrote a review of new humeral components in shoulder arthroplasty and considered whether “humeral components are getting shorter?” . At that time, only one study by Jost et al. about the results of anatomic short-stem prostheses had been published . Harmer et al. therefore concluded that there was a lack of knowledge in the literature regarding short-stem and stemless humeral components and, more importantly, that we do not know how or when these implants may fail. Since then, metaphyseal fixed implants have gained high acceptance by shoulder surgeons. Clinical results of short-stem prostheses are encouraging and are comparable to the results with other third- and fourth-generation shoulder prostheses. However, the high rate of stem loosening (8/73 shoulders) in the study by Casagrande et al. has led to some uncertainty regarding the use of short-stem prostheses . Szerlip et al. also reported on aseptic stem loosening in three patients within 1 year of surgery . In both studies, the first generation of the Ascend prosthesis without proximal porous coating was used. Szerlip et al. mentioned that all three cases of aseptic stem loosening were elderly women with osteoporotic bone. In their study, Raiss et al. reported that female gender as well as patient age > 65 years and a cortical thickness of <6 mm were associated with high bone adaptions (p < 0.024). A detailed analysis of the eight cases of stem loosening in the study of Casagrande revealed that five patients had stem loosening due to infection. Moreover, the stems in both studies were implanted using the “press fit” technique, and so there was diaphyseal cortical contact of the stem. According to the analyses of Raiss et al. and Schnetzke et al., a high metaphyseal filling ratio and a high diaphyseal filling ratio of the humeral short stem lead to significantly higher rates of bone adaptions. Therefore, it can be concluded that: the smaller the stem, the lower the risk of high bone adaptations. In this context, it should be mentioned that radiographic changes around humeral components are to be interpreted with caution. Hudek et al. showed that, depending on the radiation scatter, radiolucency in stemless shoulder arthroplasty is associated with an imaging phenomenon with a high rate of misinterpretation . Interventions on stem design have led to the second generation of short-stem prostheses with porous coating added at the proximal part of the stem. Our study includes 288 shoulders treated with the second generation of the Ascend prosthesis, and no humeral loosening was observed in the short-term follow-up. The findings from both the current study and the literature can be summarized as five potential risk factors for humeral stem loosening: (unrecognized) chronic infection; press-fit implantation (high filling ratio); cortical contact of the stem; lack of ingrowth surface treatment in the metaphyseal part of the stem; and indications other than primary osteoarthritis (e. g., secondary osteoarthritis). None of the studies reported on the feasibility of uncemented short stems. This might be because cemented stems were excluded from the analysis. According to the personal experiences of the senior authors (GW and ML) in performing shoulder arthroplasty with short stems over the past 8 years, the percentage of stems that had to be cemented for better primary stability in primary osteoarthritis is low (<1%). Cementing of the stem is more likely (about 10%) for posttraumatic cases or for osteopenic metaphysis in cuff tear arthropathy, where primary stability cannot necessarily be assumed owing to the poor quality of bone. As with any systematic review and meta-analysis, the overall analysis is no better than the methodology and biases of the included studies. Owing to the low levels of evidence of the included studies, the small number of patients, and only short- to mid-term follow-up periods, the theoretically superior results of the shorterstem design have not been shown, yet. The current literature is subject to potential biases, including different follow-up lengths, different numbers and types of patients, and selective reporting . With smaller case series, there is also the potential for bias based on single surgeon performance. Moreover, in eight out of the ten included studies, the results of the Ascend Monolithic/Ascend Flex prosthesis were reported, whereas only one study reported on the results of the Biomet Comprehensive Mini/Micro stem and the Apex™ shoulder prosthesis. Further studies including a higher number of patients with different types of short-stem prostheses and with longer follow-up are needed to show the superiority of shorter stems over standard-stem implants and to prove the theory of bone-sparing revision surgeries. Anatomical total shoulder arthroplasty using a short-stem humeral component results in good clinical outcomes comparable to third- and fourth-generation shoulder arthroplasty. In patients with poor bone quality, there might be some limitations in using a short-stem shoulder prosthesis. If diaphyseal press-fit fixation of the humeral short stem is necessary to achieve stability, a longer stem or a cemented short stem may be favorable to avoid loosening of the humeral stem in the longer term. M. Loew, P. Raiss, and G. Walch received royalties from Wright/Tornier Inc., which is related to the subject of this work. No company had any input into the review, data analysis, or manuscript preparation. M. Schnetzke, his immediate family, and any research foundations with which he is affiliated have not received any financial payments or other benefits from any commercial entity related to the subject of this article. This article does not contain any studies on human or animal subjects.